There’s just something about drinking all day that the Spanish absolutely love ;). 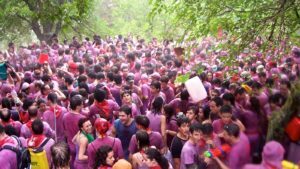 We’ve all heard of Tomatina, the famous tomato throwing festival in Buñol, but what about the Haro Wine Festival? At the beginning of every summer, the little town of Haro gets ready for one of the most unique festivals in the country. Thousands of people – dressed all in white, with red scarves – start their day at the by marching through the countryside carrying all kinds of containers filled with wine. The procession ends at the San Felices de Bilibio hermitage where people can play several different drinking competitions and games. Then comes The Batalla de Vino or Battle of Wine. Where teams are set and chaos ensues. Hundreds of people start throwing wine all over each other, with the goal of getting as soaked and purple as possible! Once the battle is over, people begin to eat and drink and spend the whole day celebrating. In the 12th century the people of the towns of Haro and Miranda del Ebro were constantly fighting over property and land, but in 1237 the villages were commanded to stop, and indicate the town boundaries with purple banners. The process of dyeing the fabric and carrying it to the town borders is more or less what the people reenact at the festival when they carry wine buckets throughout the city. Eventually the towns people added more and more traditions, like throwing wine and getting drunk after mass on the day of San Pedro. Awesome authentically Spanish Fiesta with fantastic food, amazing music and an unforgettable wine fight. 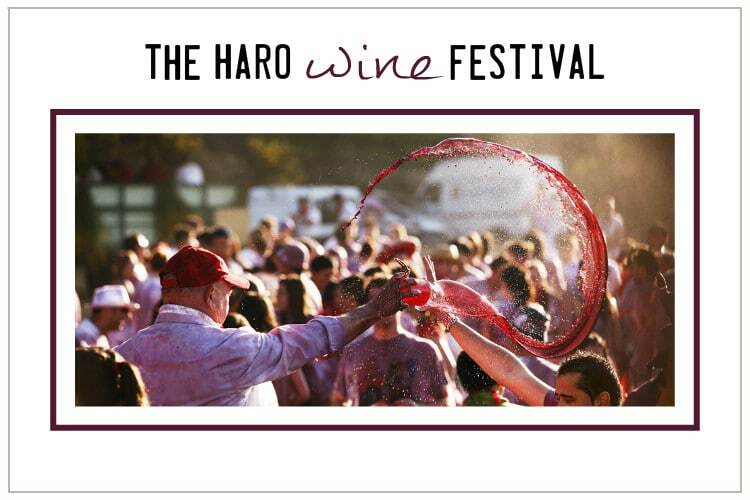 Please have a look at http://www.harowinefight.com for further information and details on the Haro Wine Fight.